Over 6,000 people from across the UK gathered in Trafalgar Square on December 10, 2012 for the annual lighting ceremony of the Chabad Lubavitch Menorah. Unprecedented publicity including a newspaper wrap, radio station call-ins, and tweets from the Menorah itself (@LondonMenorah) brought in a larger crowd than ever before. Standing 32 feet tall in London's most iconic square, the menorah, renowned for its unique and modern design has become a feature in London's city calendar. "Across London people see [the Menorah] as a the universal symbolism of the triumph of light over dark," says Mayor of London Boris Johnson, "it's about freedom here in this City from oppression." This year's event was a partnership project between Chabad Lubavitch UK, The Jewish Leadership Council (JLC) and London Jewish Forum (LJF) with support from the Mayor of London, and security provided by the Community Security Trust (CST). "It was brilliant tonight... to see many sectors of the Jewish community working together," tweeted attendee Blake Cole. Mayor of London Boris Johnson addressed the crowds from a stage which spanned the width of the Trafalgar Square steps. With typical charisma and humour the Mayor entertained the audience before starting the countdown to the lighting ceremony. Rabbi Bentzi Sudak of Chabad Lubavitch UK spoke of the Rebbe's campaign for public menorahs and the miracle of being able to celebrate publicly. 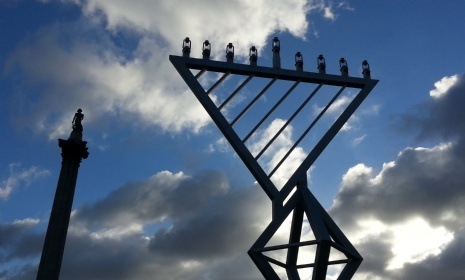 He also asked the crowd to join in a prayer for the recovery of Rebbetzin Sarah Leah Overlander, shlucha to Hendon, who together with her husband Rabbi Gershon first erected the Trafalgar Square menorah in 2007. Other speakers included Israeli Ambassador HE Daniel Taub and Gerald Ronson CBE. Live performances by Neshama Orchestra, the Jewish Lads 'n Girls Brigade Brass Band, and the Wolfson Hillel School Choir entertained the audience. The Shabbaton Choir led the lighting and were joined in a spirited rendition of Oseh Shalom by Chief Rabbi Lord Sacks. Chabad Lubavitch's Dreidelman made his star debut appearance dancing on stage, spinning his way around the square, and posing for photos with delighted children and adults alike. Thousands of free doughnuts were distributed throughout the evening while event sponsor ADOT.com kept everyone warm with thousands of free winter hats. ADOT.com also launched a twitter competition at the event in which entrants could win money for the charity of their choice. Long after the ceremony concluded, hundreds remained to dance to Neshama's energetic music. "Chanukah in the Square - the best one ever. Totally fantastic," tweeted @JewishOnline. "It's fantastic to see so many people coming together and celebrating proudly in the streets of London," said Rabbi Bentzi Sudak. "We look forward to reaching even more people next year with the light of Chanukah."